From stone to laminate there are many countertop materials to choose from if you are updating your cooking space. 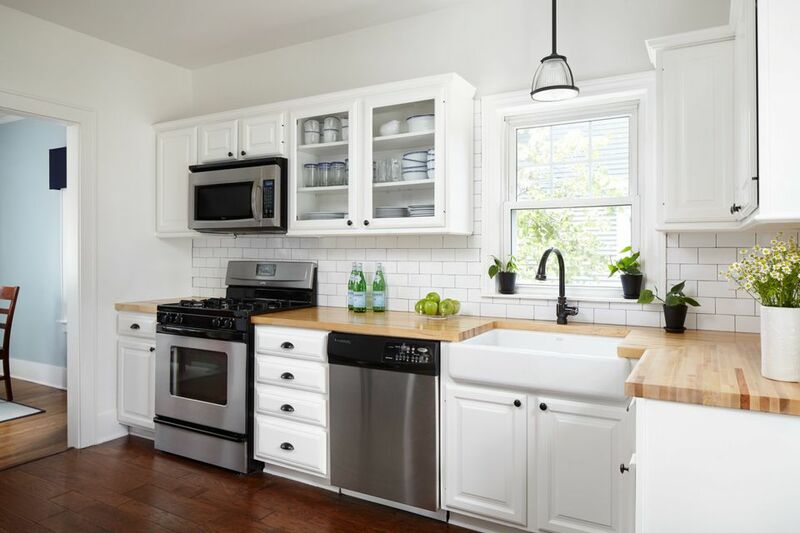 But when it comes to the perfect combination of affordability and durability, one of our favorite surfaces for hardworking kitchens is butcher block. What makes butcher block different from other types of wood slabs is the material's construction. It is made of straight pieces of wood that are carefully glued together to create a particularly sturdy surface that with regular maintenance, will last for many years. To see how you can incorporate this material in your cooking space, we gathered our favorite kitchens with butcher block countertops. Shiplap walls, black cabinetry, and beautiful, butcher block countertops in acacia wood are the winning trio in this modern farmhouse inspired kitchen featured on Maison de Pax. The open shelves with dishware are another notable feature worth mentioning. When combined with the white walls they seemingly disappear, which makes the kitchen appear bright and uncluttered. This show stopping cooking space by Avocado Sweets Design Studio based in the U.K.​ pairs rustic wood features with colorful accents. The butcher block kitchen countertops are oak and their glossy finish was created using a waterproof and food safe sealer. A deft blue kitchen range and matching over hood by Lacanche completes the space. Shannon, the home décor blogger behind by Home Made Lovely, shares every detail of her kitchen renovation here. To make every penny of her remodeling budget sing she went with affordable butcher block countertops in walnut wood instead of expensive stone. Adding open shelving to the mix instead of upper cabinetry stretched her dollars even further. If the cost of butcher block wood is priced too high for your decorating budget, you can fake the look using inexpensive poplar wood, the cheapest type of hardwood used in home construction. Here, Alyson, the do-it-yourselfer who pens the blog The Ragged Wren used the budget material to create countertops and a kitchen island topper. She says while poplar wood dings and dents a little easier because it is softer than butcher block, she doesn't mind because those little imperfections enhance her kitchen's rustic vibe. Think you cannot pair an undermount sink with a butcher block countertop? Maureen, the DIY'er behind this homey kitchen featured on her blog called Red Cottage Chronicles, proves you wrong. The trick for pulling it off is to treat the wood surface with a waterproof sealer. To keep your butcher block in tiptop condition, you will need to repeat the process yearly. Put another notch in your tool belt with this DIY project by Tootie Trouy Home that shares how to make butcher block countertops from cheap wood boards. This bright idea will cost you around $100 to build. These days many modern kitchens mix and match countertop surfaces. A fantastic for instance is this farmhouse inspired kitchen by Rauser Design based in Austin, Texas. The cooking space features both soapstone and butcher block countertops. The latter creates a food prep space next to the range perfect for slicing and dicing. We often find the best space saving ideas for small kitchens in tiny houses. This wee abode by Rocky Mountain Tiny Houses makes the most of a butcher block countertop (handcrafted from hickory and walnut wood) with a custom cutting board that covers the sink. A kitchen in a breathtaking midcentury home in Dallas, Texas gets a modern makeover that is in touch with the home's rustic location. Interior designer Erika Yeaman from Homepolish, an online decorating resource, blended walnut butcher block countertops with stained oak cabinetry. Warm up a white cooking space with cool toned granite countertops with a kitchen island with a wood topper. Here, Case Design out of Falls Church, Virginia did just that with a carbonized oak butcher block countertop. Here is another example of how to combine different countertop materials in your cooking space. The team at Vidal Design Collaborative, a firm based in California selected a butcher block countertop in American cherry wood for the kitchen island and soapstone for the counters along the wall. Black walls and a matching island instantly makes the oak butcher block counters in this kitchen appear fresh and modern. To create a little separation between the cooking space and main living area, Ban Architecture, out of Paris, France raised the kitchen floor a few inches. We think the best butcher block countertops are chunky. Studio G, an interior design firm situated in The Woodlands, Texas illustrates our point with this three inches thick, walnut butcher block countertop that they added to this custom kitchen island. A thin 3/4-inch thick butcher block countertop in maple wood accents a kitchen island in this transitional cooking space by Canada based Lynn Donaldson Interior Design. Adding another layer of visual interest to the white room is the wall covered with lantern tile punctuated with gray grout. Studio McGee, an interior design firm, based in Salt Lake City, Utah created this modern farmhouse inspired kitchen for a local client. Adding dramatic warmth to the bright space is a stained butcher block countertop in walnut wood. It coordinates beautifully with the hardwood floors, and gold cabinet pulls. Dark wood floors and light butcher block countertops add warmth to this white and black cooking space by Bonnie Gonsior, an interior designer at Homepolish, a site that helps homeowners find the perfect interior designer for their home and taste.